A regular on motorways all over the UK and Europe, the BV5 epitomises the flexibility of our box van range. Purchasers from antique dealers to mobile mechanics, small businesses to utility companies, have all found that this trailer can carry heavy loads or bulk items with ease. The BV5 series is offered with three headroom options: 5ft (which will clear most garage doors), 6ft or 7ft (not available on BV85). There are length options of 8ft, 10ft or 12ft. Carrying capacities range from 5.95m³ to 12.12m³. All sizes come with twin axles giving a maximum gross weight of 2700kg. The BV85 is also offered with a single axle and a reduced maximum gross weight of 1400kg. Tough, smart and easy to clean, the white coated side panels provide the perfect ‘blank canvas’ ready to be sign-wrtten and ideal for graphics and logos. Fully galvanized chassis and framework, resin-coated timber platform, GRP sides, translucent GRP roof. Unladen weights listed are for trailers fitted with roller shutter doors. Weights for alternative apertures can be found in the box van brochure. Phenol-coated on both sides, our ply platform floors feature an embossed grip pattern on the upper surface. The lockable low-profile coupling head ensures optimum clearance of 4×4 rear doors. The lockable front access door allows convenient access to the cargo. The sturdy galvanized steel roof frame offers strength and security. The translucent GRP roof panel makes our trailers light and airy in the daytime, while at night the interior light provides illumination. Each box van features four cargo rails (two each side), running the full length of the side panels, with closely-spaced fixing points to accept the shoring poles/cargo straps. 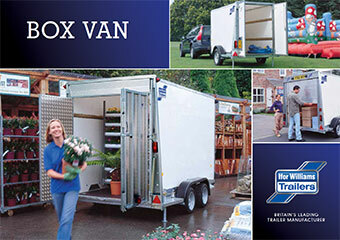 Interested in an Ifor Williams Box Van?